Fruits especially rich in vitamin C and vitamin A make this organic multi-fruit juice an exquisitely tasting treat: As little as one glass (0.2L) meets an adult’s daily vitamin C requirement. Rounded off with precious wheat germ oil, bioC Immunkraft can contribute to a normally functioning immune system and can help you to get through sensitivity to weather changes in a natural way. Every bottle of Voelkel’s bioC Immunkraft contains the best for you and your family – inspired by nature’s wealth without any synthetic additives. * Vitamins C and A contribute to a normally functioning immune system. * Recommended Dietary Allowance (RDA) = daily reference intake of vitamins and minerals for adults. All nutrition information & analysis results refer to 100ml. Drink one glass (0.2L) of bioC juice daily for your personal well-being: This will meet an adult’s daily vitamin C requirement. 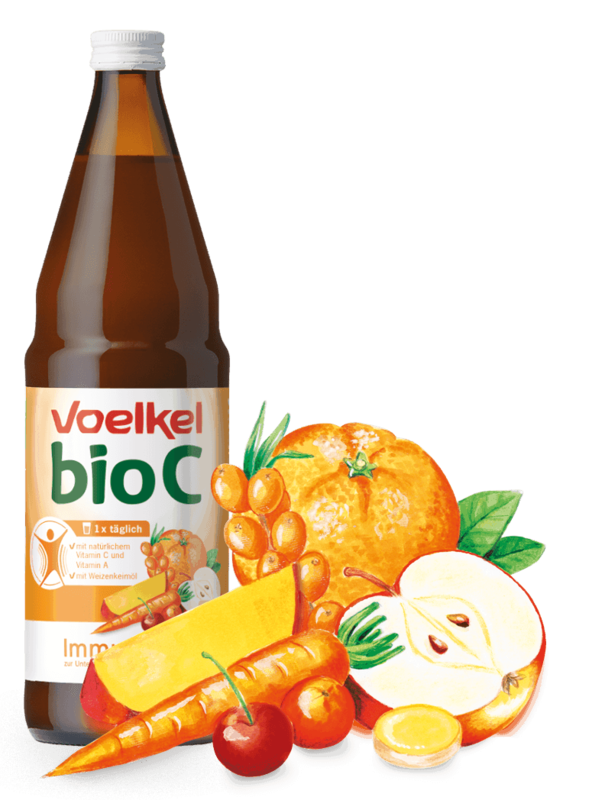 Voelkel’s bioC Immunkraft juice is available in health food shops, organic grocery stores and from specialist dealers. You can also order our juices from our online Voelkel-Shop.